Helicops Territories is a new tap down strategic aircraft shooter simulation game from armorgames. 20 years ago, the kingdom of Marcrodobia was stolen from your father. Take it back at all cost or prepare to be obliterated. Tag territory to earn money and force the enemy out of the border of your land. 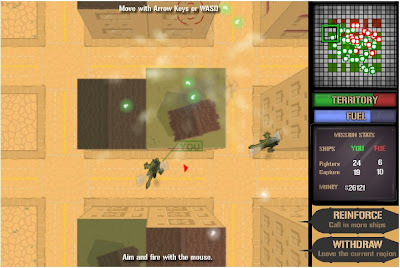 The game is controlled with WASD to move your unit and mouse for aiming and shooting. You can choose the number of units to use and fuels to allot before the start of battle but take note of the fund available to you. Here is a video of HTW Helicops Territories walkthrough for some of its earlier levels in the meantime.